GB Tell me why you chose this map. CH Sometimes beauty is being greeted with an unexpected view as you walk over the brow of some hill. It was a little like this with this map: I turned the page of the vast elephant folio volume in which it is printed, opened out the folded-down pages and there it was: it took up two desks in the British Library. Part of its beauty was its sheer magnificence, the unexpected vista of it spread out in front of me like a panorama. It is a map of the landscape between the Firth of Forth and the Firth of Clyde: the Antonine wall, built in 142 AD. It was made in the 1740s or 50s and not published until the 1790s. I had just walked the length of the wall and there was a very curious and rather poignant effect when I opened the pages: it was like seeing a young version of an old face that I knew well. I suppose the idea of loss is written into that. There is so much on this map that don’t exist any more; and so many seeds of what would happen later. 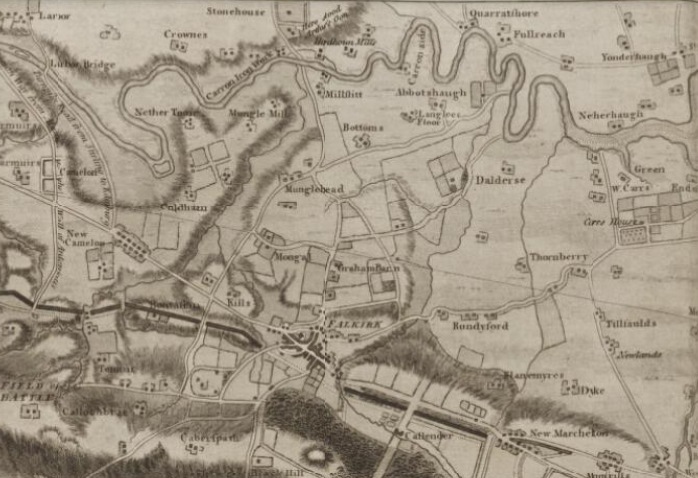 But even in between the making of the map and its publication the landscape had completely changed: the Forth-Clyde canal was already being built, a huge event in the Scottish industrial revolution. The map can’t even quite mark that moment at the knife-edge of the industrial revolution because things were happening so fast. Its beauty is tied into a certain sense of loss. I suppose beauty for me is always evanescent. One of the fascinations for me is also that the making of this map came out of the first attempts to map Scotland scientifically after the Jabobite rebellion in 1745. William Roy had a serious task of military purposefulness for the Hanoverian Government in creating a military survey of Scotland and yet at the same time he was also taking detailed scholarly plans of Roman remains as a side project. I think he felt a certain sense of fellow-feeling with the Romans, as though they were teaching us a moral lesson about the rise and fall of civilisations. Aesthetically, the map itself is also gorgeous: it’s exquisitely hand-drawn and gives an incredible sense of the physicality of the land. GB Do you think we see the past through rose-tinted spectacles? Is your view of it a little romanticized? CH Yes, for sure. I’m aware that the map was a means of control. But I think there’s something beautiful about the labour that went into William Roy’s side project. I suppose, decadently I’m more interested in what William Roy thought of Roman Britain than precisely what Roman Britain itself might have been like – or rather I am interested in Roman Britain as a place and time that people might think with. But you’re right: I’m as guilty as any naive onlooker when I admire the view from a lovely Roman fort, rather forgetting that it was once an unpleasant military installation. GB When you see the hand drawn map is there any part of you that feels smug that now we can go on Google Earth and see that someone in Falkirk has hung the washing out in their back garden? CH I love it because it’s not Google Earth. I love the laboriousness of this map and the craftwork, but I also love it because it’s a container for all these stories and emotions, the encapsulation of a moment in which things were beginning to happen. And a sense of continuity of thinking and of memory. This landscape is massively trafficked now, countless people have made their mark on that land since the Romans but there are still street names in the post-war housing estates such as Antonine Way or Grimsdyke Road (Grim’s Dyke is a medieval name for the wall.) I found it very moving too that William Roy marked the position of Arthur’s O’on on the map: that was a piece of really significant Roman architecture that the landowner pulled down in the 1740s, to the disgust of all the local antiquaries. It’s a rebuke or an act of mourning for Roy to have marked the spot. He’s recording something lost. GB It seems as though there’s a tension between celebrating the pace of change but also yearning for the past. CH I like to think that I’m watching with an arched eyebrow from the sidelines and trying to chart the different meanings that people have ascribed to Roman Britain over time – and hoping this perspective gives me some kind of a grasp on how it’s seen now. For instance, Roman Britain is now seen, particularly in the museum world, as a precursor for multiculturalism. And indeed it was multicultural, in a limited way. You could be Roman from Syria, Libya, Gaza, Spain, Belgium – and there were people from all those places living here in Britain. I get anxious about Romano-British multiculturalism being celebrated as some kind of direct ancestor of modern multiculturalism – but for sure, it’s a useful disruptor for those people who are determined to see Britain’s history as wholly white and Northern European. GB William Roy also came up with incredible innovations in making maps. CH This was a mighty achievement, the first step towards the Ordnance Survey map of Britain. GB So you’ve chosen something that appeals to you on so many levels – aesthetically, culturally, emotionally, intellectually. What makes something worthy of the word Beauty to you? CH If I can extrapolate from my own choice, it’s that there’s something about a beautiful object being a container for ideas, a carrier for a whole set of things that are emotional or intellectual – or just stories. GB Is the mystery a part of that? That the whole story can never be told? CH Yes, the evanescence and the loss. Roman Britain is a lost civilisation. Thinking about Roman Britain reminds me that that nothing is permanent. Civilisations come and go. Things fall apart. ‘Under Another Sky. Journeys in Roman Britain’ can be bought here.